>> now the big story from this weekend. the awful scene in reno, nevada. 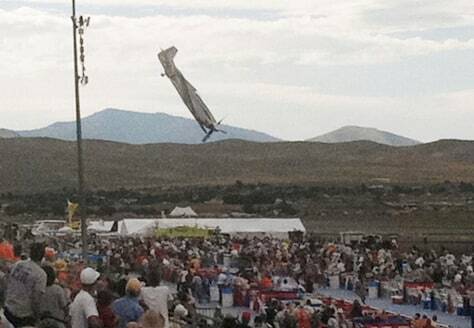 if you have been to an air show you can imagine the horror in the crowd when this modified world war ii era plane, a p-51, plunged to the ground near where people were sitting. we have exclusive new pictures. fair warning they show the moment of impact, exactly what investigators are now zeroing in on. our report from nbc's george lewis . >> reporter: ben cecil in the bleachers with his family shot the video. >> to be honest it's hard for me to talk about. there was about one to one and a half seconds he was pointed right at us. i started to flinch and then he pulled up and misses the bleachers. >> reporter: the video and earlier released still photos show part of the tail section called a trim tab missing. investigators from the ntsb found it over the weekend. the plane also carried a video camera and flight data recorder . the information stored on memory cards like this one. investigators think they have recovered some of the cards and they are hoping to find useful data. the plane was heavily modified for racing, the wings clipped and the engine souped up for speed. the pilot, 74-year-old jimmy leeward. >> i know the speed. i know it will do the speed. the systems aren't proven yet. we think they're going to be okay. >> reporter: were they okay? that's one question investigators will try to answer. in the chaos that followed the crash, volunteers rushed in to help. some fuelled up an old huey helicopter on display and flew victims to the hospital. >> it was an experience that i don't wish upon anybody. you know what i mean ? i don't wish anybody to ever go through that. >> reporter: the ntsb is expected to issue safety recommendations for preventing future tragedies like this one. A P-51 Mustang airplane approaches the ground right before crashing Friday during an air show in Reno, Nev. The vintage World War II-era fighter plane piloted by Jimmy Leeward, plunged into the grandstands during the popular annual air show.